Private yards for all ground floor condos. 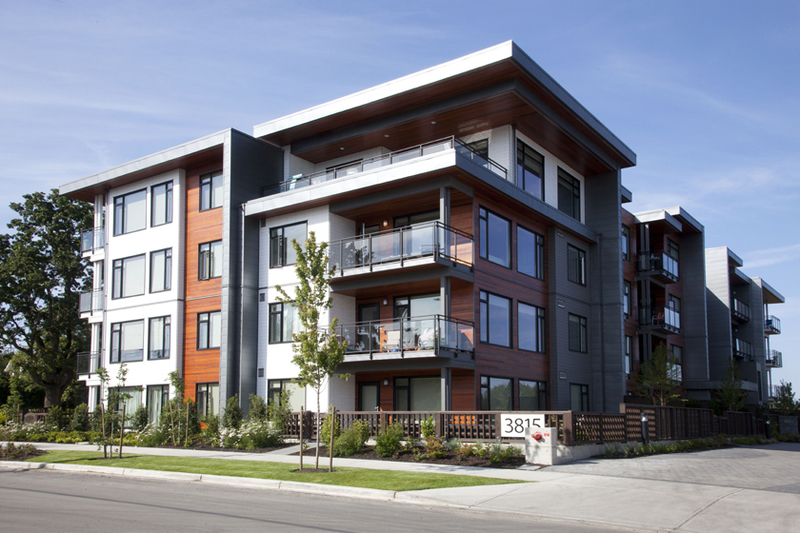 Centrally located and brimming with contemporary features, Uptown Place is the newest innovation by TriEagle Developments, a family-owned group that’s been building commercial properties and residential developments in Victoria since the 1980s. Among TriEagle’s recent projects are Ironwood at Gorge Vale, Centennial Walk in Royal Oak and Polo Park in Central Saanich, as well as a stunning cedar-and-glass commercial building near the corner of Shelbourne and Cedar Hill Cross. Longtime Victoria BC developer Spencer Lee, along with his sons Cory, Travis and Fraser, will partner once again with developers Mike and Dave Jawl to bring the project to life. These condos are purpose-designed to suit the needs of today’s busy yet discriminating buyer. Foodies will delight in the ¾-inch engineered quartz countertops, contemporary Italian laminate cabinetry with stainless steel edge-pulls, and energy-efficient cabinet lighting and recessed pot lighting throughout. Curious for more? Stop by the on-site Presentation Centre, open Saturday thru Thursday, 1pm-4pm, 3815 Rowland Avenue.